While sitting as a guest on a recent television show discussing the efficacy of chiropractic, one of the show’s hosts asked me when might it be appropriate for patients to see a chiropractor over an orthopedist. My answer: It depends on the situation. Chiropractic sports rehabilitation is phenomenal for treating certain injuries and chronic pain; however, some injuries fall outside the scope of chiropractic. Those that do, usually require the help of an orthopedic surgeon.One area where doctors must make that distinction quite often is with conditions of the knee. As a sports chiropractor in Los Angeles, Beverly Hills and West Hollywood, I come across a lot of knee problems that I would call “on the fencers”—that is, injuries we really need to investigate to determine whether they can be treated conservatively or whether they might require a surgical consult. To gain a better understanding of when to see a chiropractor and when to see an orthopedist for your knee pain, read on. This month’s article will give you a good idea of how to approach your knee problem, what steps to take to get the proper care, and what you can expect from either conservative rehabilitative treatment or knee surgery. The vast array of knee problems and their symptoms are far too numerous to go over here. What I would like to point out instead are a few instances when you have a knee injury and you’ll have to forget conservative care altogether—injuries that require you to go immediately to an orthopedist or an emergency room. These injuries usually involve a torn ligament or a dislocation. Get one of these and there isn’t a thing a chiropractor can do for you, not before surgery anyway. A chiropractic sports physician can do the post-surgical rehab, but first you’ll have to see an orthopedist. The first scenario, a torn ligament, usually happens from some sort of trauma. The most common way people get these types of knee injuries is by playing sports. There are many knee ligaments and a few different mechanisms of injury, but a very common one happens when the foot gets planted but the body keeps moving (the worst case scenario being when the body twists). In a macabre sort of way, it’s exactly as you might imagine twisting a drumstick off a whole chicken—twist and pull. Ouch! These injuries can lead to a tear of theanterior cruciate ligament (ACL), and it ain’t pretty. A torn ACL is a definite surgical situation with probably many months of rehabilitation. Season over. People can sprain knee ligaments outside of sports, too. Women, think of your heel getting caught in crack in the pavement, your foot getting stuck, but your body continuing to move—you’ll suffer the same problem as above. Youch! Or how about falling down stairs, or getting caught in a human stampede (soccer fans and pit moshers beware)? 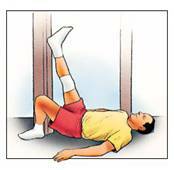 All these scenarios can lead to injuries of the knee ligaments. The classic sign of a torn knee ligament is instability—feeling that the leg is going to buckle. The other scenario, a dislocation, which is primarily of the patella (knee cap), is as nasty as it sounds. Take it from me that if this happens to you, whether from a sports injury or something else ungodly, you won’t be walking anywhere on your own. The nice people who come to pick you up will probably take you to the hospital. One knee injury that you do have a chance of treating conservatively, however, is a torn meniscus. It is one of the three most common knee conditions I see in my office, yet the only one of the three that I cannot guarantee we can fix. The good thing is that, no matter how bad the tear is, the general work I do to relieve meniscal problems will give modest to massive relief. And it will prevent the tear from getting worse too, which will give the knee joint itself some breathing room. A meniscus is a semi-circular cartilaginous disk that resides in the knee joint. There are actually two menisci (medial and lateral) in every knee and their functions are for cushion (weight distribution) and support. They sit between the femur (thigh bone) and tibia (shin bone). Because they are cartilaginous, they are spongy but tough, which means they can wear down and tear. A good analogy is to think of a pencil eraser that you pick at and tear. You’ve never done that? Oh, you should try it—very educational. So why do meniscal tears develop? Well one theory is that everything wears down with age. Don’t tell that to my Dad’s neighbor, Gladys, who still drives her 1957 Chevy (looks sharp, too, if I may add). Another (and better) theory is that, as the surrounding muscles of the knee—hamstrings, quadriceps, calves—get tight, the joint space narrows. Because the menisci are sandwiched between two bones, as the joint space gets smaller, the more these structures compress. Now think about this carefully: compress and twist, compress and twist…c’mon think of an Oreo cookie…compress and twist. Yeah, you get it… good . This wears down the menisci. And, of course, the menisci can tear during an athletic injury, much in the same way ligaments tear—planted foot, twisted body, no bueno. Tears can range anywhere from the slight to severe, and they are graded accordingly. So grade 1 and grade 2 tears are slight and moderate respectively, and they can be treated conservatively, while a grade 3 tear requires surgery. What are the symptoms of a torn meniscus? The first two are the typical pain and swelling deep in the knee joint. For me, this is the primary indicator that we need to check the menisci. Another symptom is the inability to fully extend the knee—that is, it feels better to keep the knee bent a little. Once a tear is bad enough, it may even be tough to put any pressure at all on the leg in question; so walking with a limp is another indication of a tear. With a torn meniscus, clicking is often heard; but since clicking can come from a few other things, in and of itself, it does not signify a tear. 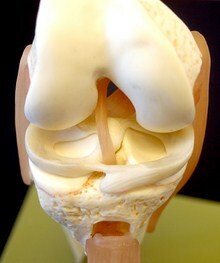 If I suspect a meniscal tear, I run through a series of orthopedic tests to check all the structures of the knee joint. One in particular is a sort of litmus test that tells me a tear is likely—it’s called McMurray’s test. Basically, this test checks the knee in rotation and flexion/extension. If we hear a click when performing this test, a tear is strongly suspected. Now understand that for us to know undoubtedly whether a tear is present or not, an MRI will probably be needed. But the presence of symptoms as I’ve described above, and a few positive orthopedic tests, can in fact give us a pretty good idea of what we are dealing with. As I’ve said in the beginning, meniscal tears are the poster children of injuries that can go either way—conservative treatment or surgery. What determines which route is needed depends on two things, the severity or degree of tear, and the disruption of one’s ability to perform their daily activities. First, the degree of tear: Just because a meniscus is torn does not mean that surgery is necessary. Many people are walking around with torn or frayed menisci and are doing just fine. 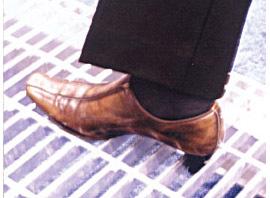 Occasionally they have some discomfort, but all in all they walk through life unimpeded. This is because slight and moderate tears (grades 1 and 2) don’t necessarily cause much pain and disability. Hey, some people have a higher tolerance for discomfort, so they don’t trip too much on little twinges here and there. Others, however, may have larger or more severe tears. Or they just don’t want to feel the pain and discomfort if they don’t have too. This is especially true for athletes, since any deviation from the norm can change one’s game in a subtle yet distinguishable manner. And in sports, success is usually determined by millimeters and milliseconds, so any disability, no matter how slight, can be a disadvantage. In these cases, the person might want to opt for surgery. The second factor in determining which option is best is the disruption to one’s ability to perform one’s activities of daily living pain free. It’s as straightforward as this: If pain prevents you from doing simple tasks, or if doing everyday movements is accompanied by pain, I suggest you get the surgery. In other words, if it hurts to walk up stairs and you have a two level house…get the surgery. If it hurts to walk down hill and you live in San Francisco…get the surgery. If it hurts to walk on the treadmill, but only after twenty minutes, and then it hurts for a day or two afterward no matter what you do, and you love working out, then get the surgery. I think that should make sense to anybody contemplating what to do, because knee surgery—plus rehab—will remove the pain, period. I’ve seen it happen for many patients, old and young, big and small, male and female—the surgery helps. In that case, why shouldn’t everybody who has the slightest hint of pain just get the surgery? Believe me, I’ve met a few orthopedists who think just that, but here’s why I wouldn’t do it unless absolutely necessary. First, surgery is surgery: It’s an invasion of anatomical structures that typically shouldn’t have foreign object placed into them. Second, surgery causes scar tissue. If you’ve read my shoulder pain articles, you’ll know how scar tissue can actually hamper the function of a joint. And third, the post-surgical treatment is rehabilitation. In my opinion, if you have to do the rehab anyway, and the rehab alone might remove the pain and fix the problem (the pain, not the tear, as the only way to fix a tear is through surgery), then why not start with rehab and see if the knee gets better conservatively. At worst, you’ll end up needing the surgery after all; and since your orthopedist isn’t going anywhere, she’ll be there when you need her. At best, you’ve saved time (the 6-8 weeks you’re down recovering), you’ve saved money (a few grand at least, and probably double digits), and you’ve saved subjecting a joint to the risks of surgery (there are always risks). And lastly, a surgically repaired body part is never the same as it was when it was healthy; but a rehabbed one can be saved and return to damn-near normal. My feeling is that if you can avoid surgery, then it’s better to do so; but thank goodness the surgery is there when you need it. You will probably start to see a theme in my articles on rehab. That’s because the principles of rehab are the same—the only thing that changes is the structure being rehabilitated, so the exercises and stretches differ. First and foremost, you’ve got to ice the knee joint. Meniscal tears cause pain and swelling, and a feeling of pressure behind the knee—massive icing parties will decrease this. If you reside in Los Angeles, West Hollywood or Beverly Hills and you have knee pain or you suspect a torn meniscus, I’d strongly suggest that you come see me. I’ll be able to help you determine whether you need surgery or not, and if we decide on conservative treatment, we’ll ultrasound the area to reduce inflammation and break up any forming scar tissue. The rehab consists of simple stretches to increase the flexibility of the quadriceps muscles, the hamstrings, and the calves. Then we go into simple movements. We need to first reacclimate the knee to moving through its proper range of motion. Next, we introduce simple strengthening exercises. Sounds easy? It isn’t, so don’t try it on your own at home. Definitely find a Certified Chiropractic Sports Physician to help you with this process. Understand that each phase needs to be introduced gradually and only when the knee is ready for the next step. There are certain movements that cannot be done at all, and if they are, you’ll reinjure the meniscus, so you’ll need a professional to guide you through that process. Further, you’ll need the therapies and management to make sure the healing process proceeds without a hitch. Knee rehab is done in most physical therapy clinics too. The distinct advantage you’ll have in a chiropractic sports physician’s office, though, is that you’ll also have your pelvis and low back adjusted, which is crucial to proper knee biomechanics (the way things move) and overall healing. Chiropractic in that regard is superior to physical therapy alone (sorry my PT friends, I know you hate when I say that). So I certainly hope that answers the question of the doctors’ on the panel regarding when to see a sports chiropractor or an orthopedist. If you live in Los Angeles, Beverly Hills or West Hollywood, and you have knee pain, swelling, difficulty putting pressure on one leg, the inability to fully extend your knee, and clicking of the knee joint, don’t waste valuable time—come see me. 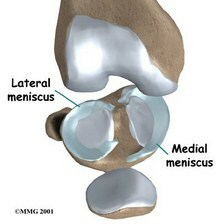 Meniscus tears that are left alone will get worse. 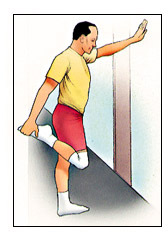 Basic rehab, stretching and strengthening must be started early to prevent worsening of the problem. You don’t want to see your grade 1 meniscal tear advance to a grade 3, now do you? Visit a certified chiropractic sports physician who has many years experience treating torn menisci conservatively and you won’t have to. I’ve saved numerous people from having to go through knee surgery. And for those who were not conservative rehabilitation candidates, I have been able to give them the necessary guidance to find the right team to perform their surgery. Either way, we’ll make sure you get the best care available to you—I guarantee it.